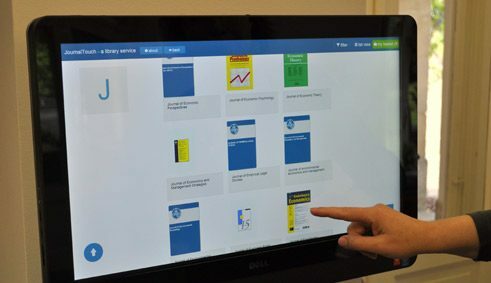 “JournalTouch”, the display of electronic journals, transfers an analogue library service to the digital world. This is how the digital content presents itself “tangibly” in the reading room. In addition to print editions of books and periodicals more and more digital editions have become available, often making printed works look obsolete. Because electronic services offer a range of advantages, they usually go down well with users. For digital content is available everywhere around the clock. It also allows a fast full-text search, unrestricted forwarding and copying, and the integration of multi-media elements. With all the benefits, largely ignored on the other hand is the loss brought about by digitalization of the social and physical added value of real environments. Because only libraries you can touch offer personal contact, tangible media objects and knowledge and research work that can be experienced with all the senses. That libraries are becoming increasingly invisible because their holdings are moving more and more into digital space has also been felt by the library of the Max Planck Institute for Research on Collective Goods in Bonn: the conversion of part of the journal subscriptions to “e-only” emptied the shelves for new publications. Thus broke away not only a much-used library service, but also a meeting place for library users, which invited them to browse and offered them the opportunity to keep up with things. The discontinuation of this information path was the initial impetus for developing JournalTouch. This innovation “re-established both the sources of information and the meeting place at exactly the same place by means of a permanently installed, touch-sensitive monitor”, explains Regina Goldschmitt of the library team that jointly developed the tool, for which they were awarded the prize “Designers of the Future in Libraries, 2015”. As usual with smartphones or tablets, the user navigates the offering on a touchscreen, which displays title pages, tables of content and abstracts. Available at present are about 300 current journals, book acquisitions and the latest publications of the Institute. JournalTouch, however, goes beyond pure display and integrates a variety of services such as printing, ordering, delivery per e-mail and the transfer of metadata to literature management programmes. Users praise the simple handling and the fast, convenient and targeted provision of information of the productive application, which has been available since July 2014. Updating is also very simple: content is fetched automatically over interfaces at JournalTOCs and CrossRef while title images are provided by a bookshop partner. “Manual updates during operation are unnecessary”, says Goldschmitt, emphasizing the ease of maintenance. But it is clear that “a tool such as JournalTouch can only be as good as its sources”. Because bibliographic data, tables of contents and title images are not always freely accessible and available in machine-readable form. Here Goldschmitt sees a need to catch up, because the said contents are “nothing more than the equivalent of a dust jacket in the real world: a promotional tool, which leads to the actual product”. Interested libraries can acquire JournalTouch with little effort. To provide individually tailored services for every case of application, the development team decided in favour of issuing as “open source”, which allows the free, non-commercial use by third parties. In a handful of other libraries JournalTouch is already in use. More than a dozen requests for it in its still young history are proof that the application clearly fills a gap. Although there were already monitors for the pure display of contents, the interactive elements of JournalTouch, which allows users to transfer contents to their own terminals, is so far unique. By deployment under the open source license the development team also hopes for the diverse development of the tool through a lively exchange with an interested community. By realizing further ideas and features, JournalTouch has taken a big step towards realizing the concept of the “blended library”. This vision of the future takes into account the requirements of digital systems that demand new types of user interfaces which integrate the physical and social skills of the user in the research process and so integrate them into interaction with library. Thus the expansion plans of the JournalTouch development team range from porting to mobile devices such as smartphones or tablets and the display of other contents (for example, e-books) to further personalization such as the selection of favourite journals. The development potential of JournalTouch has been by no means exhausted and opens numerous possibilities. Nora S. Stampfl is on the track of social change as a writer, futurologist and organisational consultant.